A significant difference in antibody reaction strength depending on the quantity of the target antigen present on a target red blood cell. This is easiest to do with an example. Let’s look at the Kidd (“Jk”) blood group system. Like most blood group systems, the alleles in the Kidd system are inherited in a codominant manner. If a person has inherited alleles for both the Jka and Jkb antigens, both antigens will be expressed on that person’s RBCs (though the RBCs will have a smaller quantity of each antigen than if two copies of either allele). 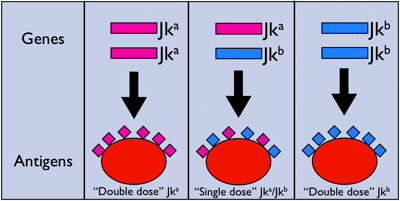 Because of that decreased quantity, we describe the Jk(a+b+) person as having a “single dose” of each antigen. On the other hand, let’s say that a different person inherits two copies of the allele for Jka (i.e., is homozygous for the allele for Jka), then that person will have a higher quantity of Jka than the Jk(a+b+) person (we say that the homozygous person’s RBCs have a “double dose” of Jka); see the figure below. 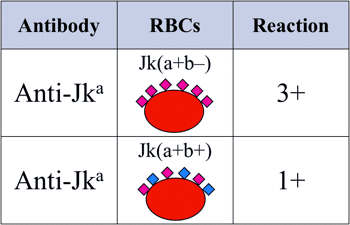 An antibody against Jka may react in a significantly stronger manner when mixed with Jk(a+b–) RBCs (“double-dose” of Jka) than with those from our other patient with Jk(a+b+) RBCs (“single-dose” of Jka); see this outlined in the figure below. If an antibody gives a stronger reaction with RBCs double-dosed for the target antigen, it shows the dosage effect (or just “dosage”). The dosage effect is most prominently identified in antibodies associated with the Duffy, Kidd, Rh, and MNS blood group systems. Understanding dosage and how it affects the identification of antibodies is essential when evaluating an antibody panel (see the Antibody Identification Basics video for more information; scroll to the 12:30 mark for this specific topic).